High Density Electric Compact Mobile Filing Systems can save up to 50% of your office space with the push of a button. 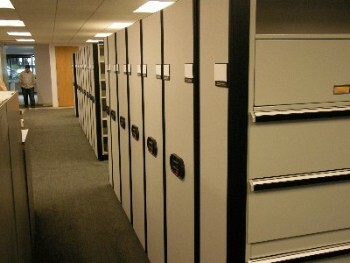 High Density Electric Mobile Filing Systems provide safe, quick and efficient ways to reach your media. All Mobile Filing systems can be custom designed to meet your filing needs. Older Electric Mobile Filing Systems and also Mechanical Assistance Mobile Filing Systems can be retrofitted with a new electric system or converted to an Electric High Density Mobile Filing System.